As known as a Mind-map. A Brainstorm is a diagram used to map associated ideas, words, images and concepts together. Brainstorms are also a tool and method for idea generation, finding associations, classifying ideas, organising information, visualising structure and a general aid to studying. Brainstorms are often used at the initial stage of a project and work as a form of note-taking. They can also be useful in collaboration work and team-building morale. The structure of a Brainstorm is as follows: major categories extend out from a central node. 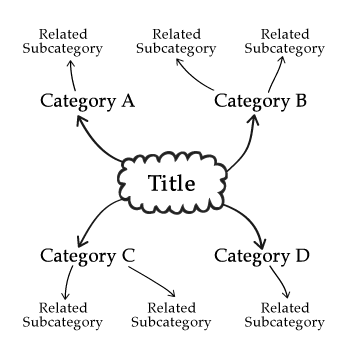 Lesser categories branch out of the major ones as subcategories, which can also develop their own related subcategories. 1. Start in the center of a page and write the title of the project or topic by encapsulating it in a shape (typically a circle or cloud). 2. Think of relevant, useful or related words or categories to the subject you are investigating. 3. Then, for each category, draw extending out of the central title (in any direction), lines with the name of the category at the end. 4. Now for each of the categories, think of any words that relate to it and draw in the same fashion as in the previous step. 5. You can repeat step 4 for the new set of subcategories or highlight words if need be. Need to access this page offline? Download the eBook from here.